Cars whizzed by me on the street as a constant flow of traffic entered and left the intersection. Occasional car horns broke through the rumbling engines in stopped traffic and the music coming from inside people’s cars. Car brakes screeched and airplanes passed overhead. Pedestrians on the sidewalks and crosswalks crunched leaves in their paths. People near each other, on the same side of the street, could hear each other speak but most people passing by foot or by bicycle travelled quietly. Warm breezes from the sun’s heat combined with the traffic exhaust came in waves. It is possible to sit on solid stone ledges or wooden benches (with backrest and armrest). A mild odor from car exhaust filled the air. People crossed the intersection, using crosswalks, alone and in groups from 2-4 people. One couple pushed a stroller with a toddler inside while several other individuals carried backpacks. All pedestrians travelled at a leisurely pace on the sidewalks and while crossing the streets. Littered with cigarette butts and dead leaves, the sidewalks leading up to the intersection remained open. However, the streets were relatively clean and free of litter or debris. Trees planted in the sidewalk lined the streets, but buildings towered over them. Signs for the interstate and state highways become visible for drivers approaching the intersection from all directions. The buildings situated at the intersection’s four corners were the county courthouse, the old county courthouse, and two churches respectively. A historical marker could be viewed in front of one of the churches. A cluster of large stone war veteran memorials occupied the space at one corner of the intersection in front of the old courthouse. A large American flag flapped next to a Pennsylvania state flag in the air on a flagpole in front of the new county courthouse. 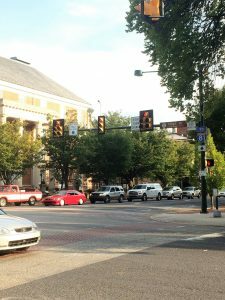 Pedestrian walking signals and buttons as well as red light cameras were placed on all four sides of the intersection. Bicycle lanes were drawn on either side of the street, in both directions but only a few cyclists passed. In between the two bicycle lanes, the traffic divided into four lanes (three for one direction and one for the opposing direction). Smaller cars, trucks, vans, SUVs, and motorcycles passed through the intersection using the lanes drawn onto the street. The traffic light system created a hub where groups of people and groups of vehicles stopped and collected in the same space. 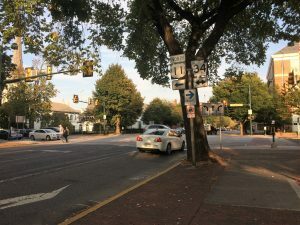 Although vehicle-related noises dominated the soundscape of the intersection, the presence of bicycle lanes and public benches as well as wide sidewalks demonstrates that the space is functional for people and vehicles. The mixture of trees and pavement as well as leaves and cigarette butts suggests that the city designer incorporated nature into the suburban town. 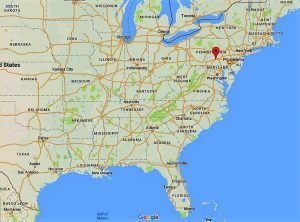 It is important to note that Carlisle, Pennsylvania is a distribution hub for the east coast and many trucks transporting goods pass through this city as two interstates run through the city. This lens could be helpful for understanding the significance of risk, resilience, and human security in a landscape because the unique characteristics of a scene often indicate social norms and values that people would consider relevant in their every day lives. This entry was posted in Uncategorized and tagged carlisle, lens, meinig, observation, pennsylvania, place. Bookmark the permalink.